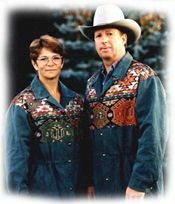 Nifty is a family business based on a ranch at Veteran in east-central Alberta, Canada. The ranch consists of 3600 acres of dryland, with a 200 commercial cow/calf operation. In the rolling plains of east central Alberta, the ranch is less than an hour from the Saskatchewan border. Calvin and Judy Bishell, owners of Nifty Livestock Equipment, focus their business on products that benefit livestock producers, ranging from a full line of cattle handling equipment to watering systems and feeding/fencing supplies. Before adding any new product to their product line, it must first be "ranch-proven" in their operation. Most of the products are a result of their search for better and easier livestock handling equipment for their ranch. "We don't sell anything that hasn't been used on our ranch, and we don't sell anything we don't believe in". They also offer a referral service to their clients for products they are unable to supply. Nifty Livestock Equipment Ltd. got its start in 1986 when Calvin invented the Nifty Feed Dispenser, ending his search for a suitable option for dispensing grain, pellets or supplements to livestock under range feeding conditions. Several dry years forced the Bishell's to resort to feeding pellets and straw during much of the year. After trying various labor and time consuming methods, such as hauling pails and sacks, and observing others using hoppers and open trucks, Calvin set to work devising a better method. From this first invention of the Nifty Feed Dispenser, Bishell's have continued to expand the line of products they offer to clients across Canada and the US and even as far away as Australia. With a good supply of inventory on hand at all times, orders can be filled and delivered quickly. The product line for Nifty Livestock Equipment Ltd. has expanded from their own manufactured products, to a whole range of products including Hi-Hog Farm and Ranch Equipment (panels, gates, handling systems), Ritchey ear tags, El Toro Electric Branders, Promold Products (cattle oilers, plastic water troughs and winter watering systems), and Cattle Drive in Progress signs. Clients are spread across Canada and the US, as well as Australia. All of these products are available through Nifty Livestock Equipment Ltd. and their select dealers. You can also find them at some Canadian trade shows, including Agri-Trade, Agribition and the Camrose Bull Congress, and they have attended shows in Spokane, Billings and Denver in the US. They are listed in "Prairie Farmers Catalogue - The Book" and "Prairie agriculture Directory" in Canada & US.